Once again the waters of the Trevi Fountain are flowing. And tourists ever hopeful of a return visit to the Eternal City are throwing coins over their left shoulders into the fountain. This follows a seventeen month restoration project that cost over two million Euros, funded by the fashion house Fendi. Each year millions of tourists make their way to Piazza di Trevi, and by all accounts the scaffolding hiding the dry Baroque sculptures did not stop them. An estimated three million people visited the attraction while under restoration over the last 17 months. While we all marvel at the Baroque fountain and the magnificent background of the Palazzo Poli, few visitors know of the Roman origins of this fountain, let alone get to see any of the archaeological remnants related to the fountain’s origins. The most recent restoration of the Trevi Foundation followed an incident in June 2012 when bits of sculpture came tumbling down off the façade of the Palazzo Poli. The authorities in Rome blamed the bad weather of the previous winter, opposition political parties blamed a lack of maintenance and funding for such work. In a development that raised a few eyebrows, private funding was then sought to finance the much needed checks and restorations required to prevent further damage. And that is where Fendi stepped in, with a cheque for over €2 million. Other companies and individuals are behind the financing of other major restoration projects in Rome, notably that of the Colosseum thanks to Diego Della Valle, chairman of Tod’s Shoes, and his €25 million cheque. The Trevi Fountain is quite understandably one of the most popular attractions in Rome. One of the traditions is to stand with your back to the fountains and throw coins over your left shoulder into the water. This is said to ensure your return to the Eternal City. On my one and only visit I did not turn my back and throw the coins over my left shoulder … that explains why I have not returned then! Besides this quaint legend, the fountains are truly spectacular and have featured in many popular films, the most well known of which must surely be Fellini’s 1960 film La Dolce Vita. But what we crave to see today is not that old. The stone sculpture that makes up the magnificent statues and the elegant backdrop in the Palazzo Poli were created in the 18th century. 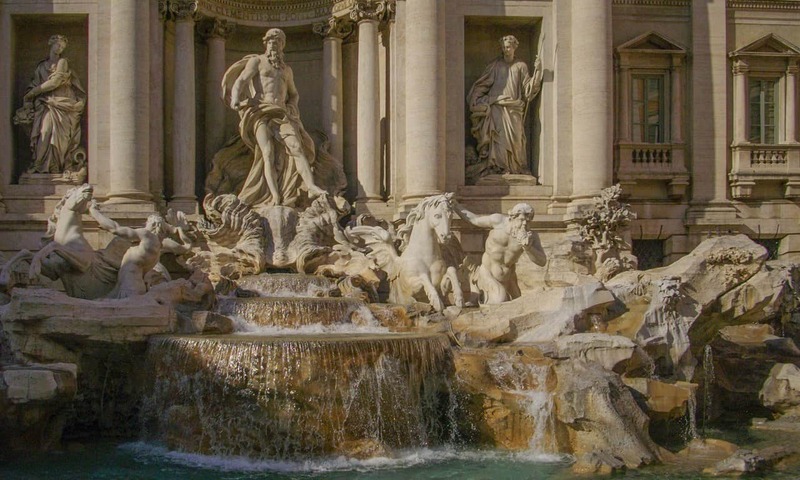 There is more to the Trevi Fountain – especially for the die-hard archaeology geeks. What’s more, there is more to see too. The grand Baroque fountains we visit in our millions today was built at the end of an aqueduct that fed the fountains. Acqua Vergine, as the aqueduct is still known, ended at the junction of three roads, tre vie, which became trevi. More interestingly, this aqueduct is also called the Acqua Vergine Antica, because it followed much the same course as an earlier, Roman aqueduct, and used some of the very same channel of that aqueduct. The Roman aqueduct, completed in 19 BC by Marcus Agrippa during the reign of Emperor Augustus, was one of 11 aqueducts that supplied the ancient city with water from springs and other sources in the surrounding countryside. Historical documents tell us that a young girl had taken a group of soldiers to the spring and so the name Aqua Virgo – virgin waters – was used. This ancient aqueduct carried water from the spring for some 20 km, most of which was via underground channels, beyond the present-day location of the Trevi Fountain to a point near the Pantheon. The Aqua Virgo supplied the Campus Martius, that large, flat area north of the Capitoline Hill, with around 100,000 cubic metres of water daily. According to some Roman historians, the Goths tried to enter Rome via the Aqua Virgo. Whether this is true or not, the aqueduct fell into disrepair with the fall of the Roman Empire. The first restoration of the aqueduct was carried out in the 8th century, but it was following a much more substantial restoration and remodelling from the source to the end point at the Trevi Fountain that it was consecrated by Pope Nicholas V as the Acqua Vergine 1453. Little remains of the Aqua Virgo today. But there are elements of the underground channels that still survive at one or two points along the route in the basement of buildings not open to the public. 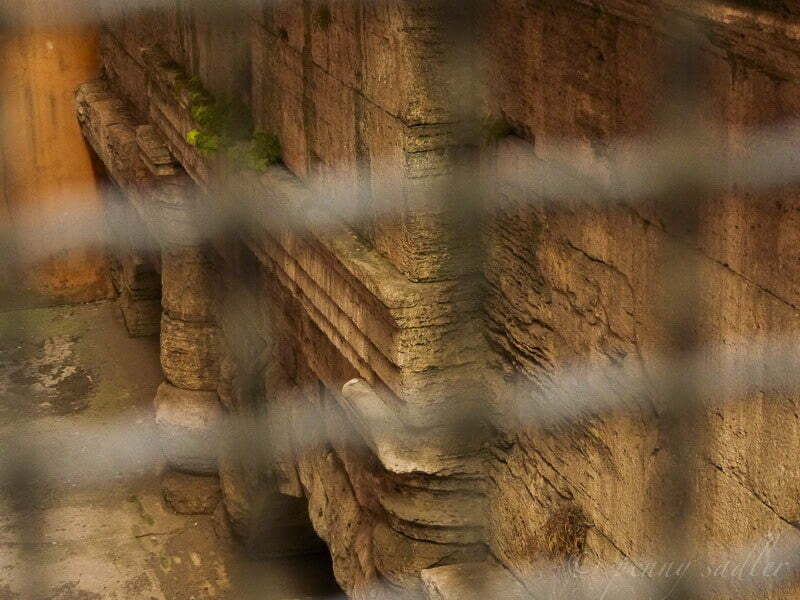 One such location where Roman remnants of the ancient channels can be seen is behind the Trevi Fountain. From the fountains, follow the side street (Via Poli) on the left hand side until it reaches Via del Tritone. Cross the road, and turn right until you each another side street on your left. Look out for the Caffè Accademia and Burger King – the side street, Largo del Nazareno, runs between the two. This spot is marked with a light blue map-pin in the map above. At number 14, on the left hand side of the road, behind the railings and below street level are the remains of one of the arches that carried the Aqua Virgo across a street. You will not be able to see it, but there is an inscription on the architrave that dates the arch to 46 AD. Apparently Claudius saw the need to point out that he was responsible for rebuilding large sections of the aqueduct at this point because Caligula had removed stone for use in constructing an amphitheatre. 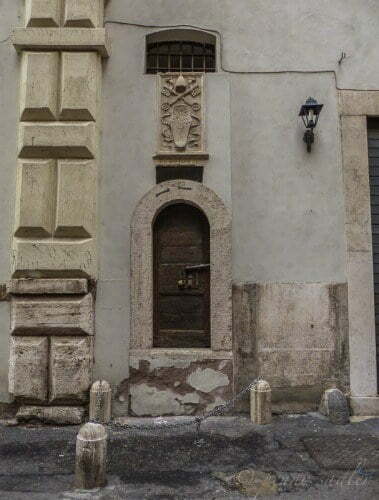 On the wall behind you, on the right hand side of the road (Largo del Nazareno) – and marked by stone bollards with metal chains, is the small, round headed doorway illustrated here. This is the inspection door to the still functioning specus, the water channel, of the Acqua Vergine. Still today, many Romans believe in the restorative powers of the water brought into the city via the channels of the Acqua Vergine. If you need an excuse for a drink (if one ever needs an excuse for refreshment while sightseeing) take a break in the Caffè Accademia. From here you will get a good view of the Roman arch from the back of the café. For the photographs, my thanks to Penny Sadler – author of Adventures of Carry-On, a travel blog with lots of beautiful photographs and inspiring articles about art, architecture, culture and people. NextIs Benwell Roman Fort on Hadrian’s Wall Worth a Visit? You are a pro! By the way, love the new site!